This week a patron from St. Louis came into the Library Special Collections Reading Room looking for documentation relating to his ancestors’ 1809 marriage in Warren County. 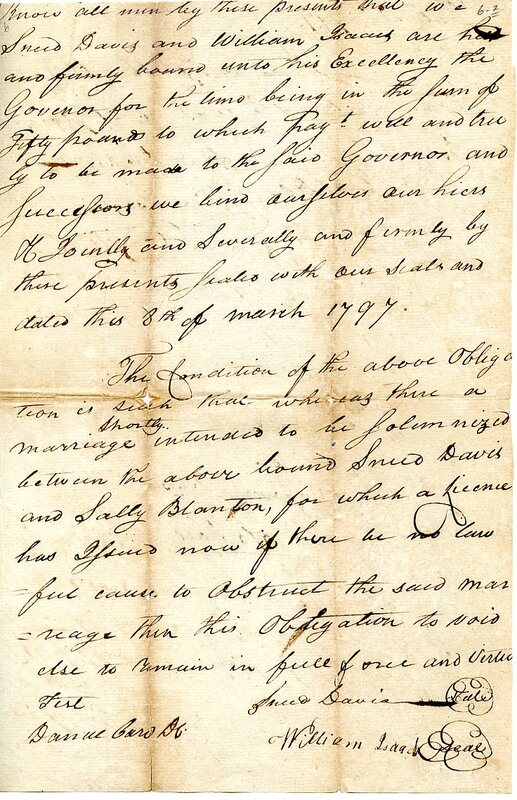 He had already been to the courthouse, where he was told that Special Collections had many of the original Warren County marriage bonds from 1797 to around 1850. I was thrilled to be able to help him, because he was our first in-house patron to use the scanned Warren County Marriage Records online in TopSCHOLAR. Rather than pulling out the vulnerable originals, I was able to guide him through the search process of finding the record online. The marriage records have been scanned in the same order they appear in the collection, which is first arranged chronologically by year and then alphabetically by the gro0m’s last name. If you don’t know the groom’s name, then you can do a keyword search by the bride’s maiden name by using the search box that appears in the top left corner of the page. At this time, we only have the first fifteen years online. We are adding new records incrementally as we complete the scanning and encoding. An original Warren County marriage document from 1797. Scanning these records and making them accessible is a time consuming and expensive process. Personnel in Manuscripts & Folklife Archives will make tremendous progress on the project this summer, as we have a student and one part-time employee committed almost exclusively to the project. The funding for their wages was made possible through a challenge grant made by Marilyn Forney, a friend of Special Collections from Pennsylvania but with local family ties. Her grant was matched by members of the XV Club, Ray Buckberry, Tad Donnelly, Dean Connie Foster, and Jonathan Jeffrey. The marriage records are our most requested resource both in-house and online. This digitization project will not only make the items accessible to the public in the comfort of their homes, it will help save the documents by decreasing human handling. To peruse the records scanned thus far click here.